Your users are on Twitter, and being able to answer their queries and complaints gives your customers a feeling of security in knowing that a company is listening to them and interested in assisting should a problem occur in the future. Big companies such as Dell and Nike already have brand awareness. Twitter is a way of branding yourself and your business to be more personal rather than just a logo. It allows companies to get feedback on their services to share with others via the website or on other social platforms, as well as to improve on their current offers from the very people who are utilising their product or service. Setting up a page is free; the only costs associated are the use of Twitter ads and a community manager who will share valuable content and interact with potential customers and influencers in your industry. The chances of a person buying a product or service from a company they are following on Twitter are higher. Your competitors are already on the social platform and they are eating a piece of the Twitter pie. People of all ages are making use of it and not having a presence on the network means that your competitors are benefiting from potential sales that you are possibly missing out on. It is still rising in popularity, with the fastest growing demographic being people between the ages of 55- and 64-years-old. Everyone is tweeting and your brand should be, too. More and more customers are turning to Twitter to get the service they expect from brands. Brands that respond to queries and show that they care about their customers will be more profitable and benefit from brand loyalty in the long run. More and more people are making use of Twitter as part of their online marketing activities. 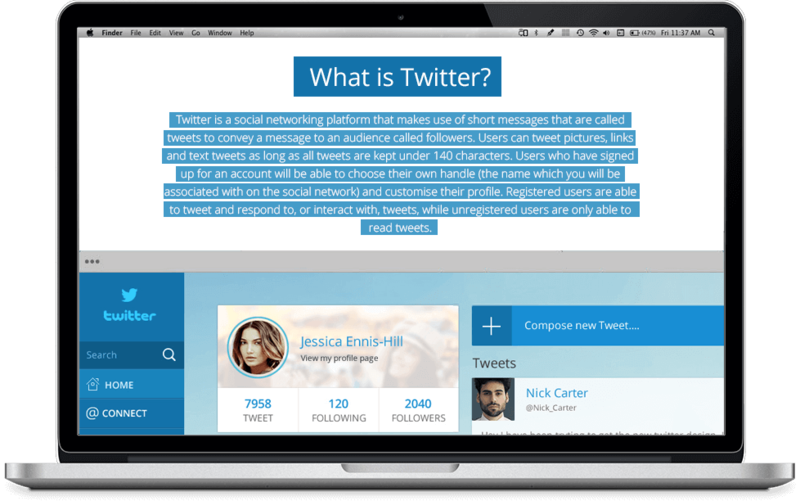 assist you with setting up and managing your Twitter account for effective results.